For the treatment and prevention of flea infestations, control of flea allergy dermatitis, control of ticks, sarcoptic mange mites and biting lice on dogs. To protect against fleas, apply monthly. For protection against paralysis ticks apply every two weeks and to protect against brown dog ticks apply monthly. Treats biting lice and aids in control of sarcoptic mange mites. Do not use on rabbits. 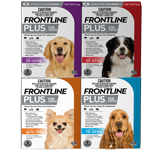 After application of FRONTLINE ORIGINAL for Dogs. You can handle your pet as soon as the application site is dry. Your dog can swim or be bathed from 48 hours after application. 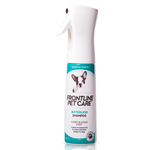 For how to apply see product label for full instructions and view the video on the FRONTLINE PLUS page. 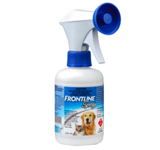 Speak to your vet for further advice on flea control using FRONTLINE ORIGINAL For Dogs or call our Customer Care line on 1800 808 691. Break the snap-off top from the pipette along the scored line. Choose an area where licking cannot occur, e.g. back of the neck. Part the coat until the skin is visible. Place the tip of the pipette on the skin and squeeze several times to empty its contents directly onto the skin. Take care to avoid excessive wetting of the hair as this will leave a sticky appearance of hairs at the treatment spot. However, if this should occur, it will disappear within 24 hours of application.